A pescadero is a fishmonger if you didn't get that far in your high school Spanish class. It's also the name of a charming town down the coast a bit between SF and Santa Cruz. The town began as a rancho like so many of the historic communities in California did, but nowadays it's one of a number of eclectic little villages along the scenic Highway 1. Since the Fog Cutter was inspired by a trip to the Pigeon Point Lighthouse, we wanted our newest all-road bike to go with the theme of NorCal beach destinations. So what's the deal with this bike anyway? As you may know our ES road sport frame was originally called the Smoothie "Extra Smooth", because it fit wider, more comfortable tires than our Smoothie road race bike. Believe it or not, it was the first Soma I ever bought back when I was first greasing chains and patching tubes at the local bike shop. And it's a great bike. It's been largely unchanged since we launched it aside from a new coat of paint every few years, but I would guess there are probably hundreds of ES that still get ridden every day. Well we got to thinking, wouldn't it be sweet if the ES could fit the new 42c Supple Vitesse road tires that we make. Unfortunately 57mm road brakes max out at about 33mm wide tires. That was huge only a few years ago, but things change and sometimes you just need more in your life. As it turns out, the brakes were the only thing holding us back so we went ahead and made a frame set that fits 67mm reach brakes and voila! Without changing the geometry or the handling we were able to reinvent this classic Soma. And I have to say, it rides great with these tires. If you've never ridden the Grand Randonneur 650b x 42mm tires then you might think a 42 would feel like a beast, but you'd be dead wrong. 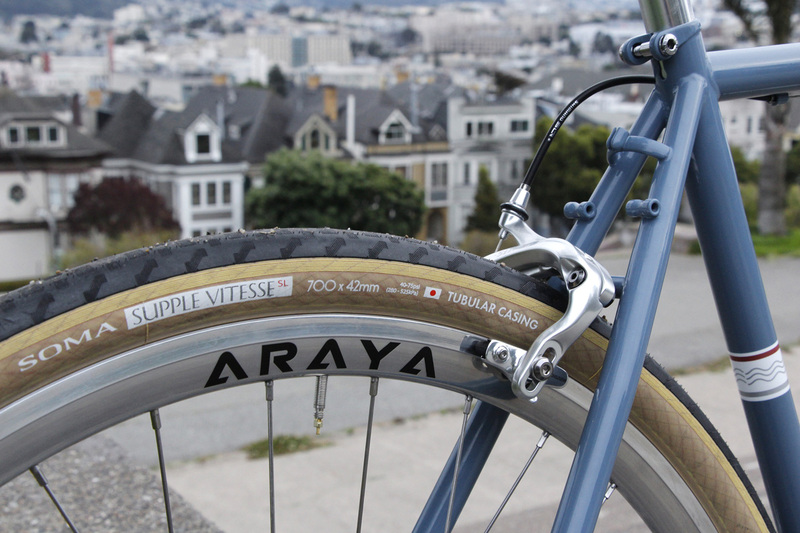 They're super fast and plenty light (perhaps the lightest tires available in this size). If you can't afford the splendid Paul Racer brakes, these Rivendell/Tektro 73mm reach caliper brakes work well, too. We positioned the brake bridge in a way to keep the pads high in the slot to minimize arm flex. Some people feel that long reach caliper brakes just aren't quite responsive enough. I can't say I agree with that, since I've been riding them for years, but to those people I'd say you have two options to consider. Option 2. Centerpull brakes! Remember those? Mafac, Weinmann, Dia Compe? Even Shimano used to make them. Anyway, Paul Components up in old Chico, CA makes some and they are just bitchin. Great stopping power, tons of fender clearance, stiff as a metaphor and boy-oh-boy do they look nice. We even included a special cable hanger in the back so you don't have to use one of those dangly ones. But wait, there's more! We got those rack eyelets, baby! It'll take a front and rear Champs Elysees rack, a Porteur Deluxe up front, a Nitto Mark's rack or one of these new Gamoh jobbies that's in the pictures. Now remember I said it's exactly like the ES, so it isn't low trail. We might do a different fork some day but for now this is it. That said, it rides great. If you want low trail you probably already know all about that stuff, so I won't bother getting into it here. What else? Uh, Breezer-style hooded dropouts. Groovy fork blades. This sweet blue paint job. What more do you want? These will be coming in March I think. Hopefully. Anyway, if you want one your LBS can pre-order one through Merry Sales and you can just kick back and listen to some Electro Swing or whatever the kids are into these days. Cheers y'all!